I have just uploaded a new copy of the core rulebook to the Core Rules page. This update is mostly rewriting, clarifying and defining some items. Firstly, I have rewritten the description for the armour penetration roll so that it make more sense. It felt a bit backwards before. I have also made some amendments to the Vehicle Special Rules section later in the rulebook. I have moved some things around, separated and properly described the definitions. I have described the different types of armoured and unarmoured vehicle descriptions and special rules. I have also worked through all of the different vehicle weapon mounts and the rules that apply to them. While these amendments do not change how the game plays, it should clarify these rules and makes sure they are all defined in there rather than leaving them a bit vague. I have just uploaded the first copy of the German Half-Tracks document. It currently contains all of the Sd.Kfz. 250 and 251 variants, as well as the 252 and 253. More will be added at a later date. We are also working on the German Armoured Cars, so keep your eyes peeled for that. The German Half-Tracks document is available to download from the German Forces section now. The intent is to separate out the different type of vehicles for the larger forces, like the Germans, so that it is a little easier to find what you are looking for. The Armoured Fighting Vehicles (tanks and SPGs) will be in one document, the half-tracks in another, then the armoured cars, staff cars, trucks and other support vehicles will be in another. With the Germans, because they have so many armoured car variants as well, may have them in a separate document. I have just uploaded a new copy of the weapons crib sheet to the Core Rules page. This small update adds in the details for the Ordnance QF 75mm Gun. This is the gun fitted to the Cromwell and Churchill Mk.VII tanks. With these being amongst the most popular tanks for the British, this addition will surely be welcome. Adapted from the 6 pounder by drilling out the barrel to increase the calibre (without altering the outward appearance) the weapon was able to fire a more effective HE round than the more common 6 pounder, and the 17 pounder, while having inferior AP rounds. This was ideal for vehicles designed to engage ‘soft’ targets. The HE value of the 75mm gun’s round is 2 higher than for the 17 pounder and a substantial 4 higher than the 6 pounder’s round, marking a significant increase in effectiveness against infantry.You will note that the Point Blank range AP values do not show the mm value. This is because I was unable to find quoted AP capabilities within this range. So, using my experience thus far, I have included AP values that I believe most likely for those rounds. I’ve been making progress on the diorama. Focusing on the railway station just now. As promised, I have just uploaded the latest copy of the rulebook to the core rules secion, with the latest changes as detailed below. Prepare for a big post. Check out the Core Rules section here. Change to Wheeled Vehicles and High Mobility Wheeled Vehicles. Addition of the Half-Track vehicle type. Turret rotation and slow turret traverse special rule. Changed to how Concussive Damage from HE works. Changed how Improvised Armour works. Addition of Spaced Armour rule. Rules for Small Arms firing at Extreme Range. Moved the Blast Shield rule to the D10 system. Overhauled the rules for Flamethrowers. Moved, clarified and expanded the rules for Fire. Added rules for Limited Traverse SPGs. Added clear definitions for Dice, Dice Rolls and Blast Templates. Cleared up the definition for Lucky Shots. Changes to the Vehicle Damage Table. Addition of more in-depth ‘System Damage’. Wheeled Vehicles: To better reflect the agility of wheeled vehicles compared to tracked vehicles, they can now turn up to 90 degrees per move point, rather than the usual 45 degrees. The main downside of wheeled vehicles is moving much slower off-road and an inability to cross difficult ground and cover. High Mobility Wheeled Vehicles: This rule covers wheeled vehicles that are better at driving cross country, such as the German 8-wheeled armoured cars. High Mobility Wheeled vehicles turn as freely as Wheeled Vehicles, but do not get slowed extra when going off road. Also, they are able to move across Soft Cover, but are still unable to cross Hard Cover and Defences. Half-Tracks: These vehicles used to just be referred to as High Mobility Wheeled Vehicles, but now have their own type, while still following the same rules. Turret Rotation: I have added into the Vehicle Movement part of the rules a section that clarifies that rotating a vehicle’s turret does not count as Moving, does not use up any Move Points and can turn as much as you like, but may only be moved once during the Movement Phase. Slow Traverse Turrets: I have been meaning to add a rule to cover vehicles like the Soviet KV-2, British Bishop and US Hellcat, which have turrets that turn very slowly. A Slow Traverse turret may only turn up to 90 degrees during the Movement Phase. Concussive Damage: Only a slight change to the rules for Concussive Damage, mainly rewriting it to be clearer. Concussive Damage from powerful HE rounds (with a HE Value of 16 or more) is worked out by making a roll on the Vehicle Damage Table, without applying any modifiers. It was while looking at the Concussive Damage rule that I decided to make changes to the Vehicle Damage Table. Improvised Armour: The rule for Improvised Armour is intended to cover some ‘battlefield modifications’, such as US troops piling sand bags onto the front of their tanks. 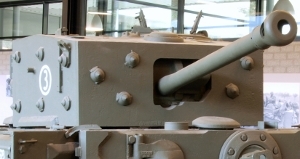 While the additions in actuality provided no additional protection against AT rounds (and could be disastrous when hit by HE), they did make those vehicles heavier and less manoeuvrable. The old version of the rule didn’t really represent this as it also covered spaced armour, so added 2 points of armour to that facing, but removed one Speed Point. The rule still reduces the vehicle’s Speed Points by 1, but instead of the increased armour it reduces Concussive Damage. Spaced Armour: I have now added a separate rule governing Spaced Armour, which includes side skirts, track guards and ‘bed-spring’ armour. When an armour facing equipped with Spaced Armour is hit by a HE or AT round, the Spaced Armour is destroyed, but will offer protection against that shot. Spaced Armour will completely nullify the effects of HE and HEAT rounds as they are detonated before reaching the vehicle itself, while the Penetration Roll of other AT rounds is reduced. Spaced Armour is unaffected by Small Arms. Extreme Range: While I had added the modifier for firing Small Arms at Extreme Range, I had not added the conditions which allow a weapon to fire at that distance. A Small Arms weapon must be Mounted and Stationary to fire at Extreme Range, such as using a tripod, mounted on a vehicle or some other fixed position. Blast Shields: I noticed that the rules for Blast Shields were still using the old D6 system, so I have now reworked the rule to the D10 system we use now; essentially changing the roll which destroys a gun equipped with a Blast Shield. However, I did notice that the base rule for damaging a field gun is mixed in with this rule so I still need to go back at a later date and redo the rules for field guns. Flamethrowers: Previously, Flamethrowers could only be used in in CQB. I have now removed this limitation. You do still have to get very close to a target to use a Flamethrower. I have also clarified how Flamethrowers damage vehicles. The rules for Fire, limited as they were, used to be lumped in with the Flamethrowers, but I have now moved it to the Battlefield Effects section alongside Smoke. Fire: The rules for Fire can now be found alongside Smoke, as Smoke Templates and Fire Templates share most of the same rules. The difference being that they use different tables to determine what happens in subsequent turns. While Smoke can only diminish, remain the same or drift its position, Fire can diminish, grow and spread. The other difference is that models cannot move through Fire Templates. Limited Traverse SPGs: I have now added a rule that covers self-propelled guns with a narrow gun traverse arc, or have the gun in a fixed position. Limited Traverse SPGs must turn to directly face their target. Gaming Component Definitions: At the start of the rulebook, under the Gaming Components heading, I have described the different dice, dice rolls and templates that are used in Focused Firepower. I may add others if I think of more that would be better described here. Lucky Shots: I have also clarified just what counts as a Lucky Shot. Despite being a very waffling entry, it wasn’t particularly clear before. Vehicle Damage Table: As I have mentioned, I have made some changes to the Vehicle Damage Table. Crews are now forced to take a Morale Test one result lower, but do not suffer additional damage at that level. I have also removed the Weapon Destroyed and Immobilised results, which only had one line each, and added a System Damage result to three results on the table. I have also removed the pointless Light Damage and Heavy Damage terms. System Damage: I have replaced the Weapon Destroyed and Immobilised results with a new System Damage result, which will give us much more variety to the damage inflicted upon vehicles. If you get a System Damage result on the Vehicle Damage Table, you then roll to see what form this damage takes. There are currently 4 results on the table, but this system will allow us to add other effects at a later date if we need to. The first result represents only minor damage that has no further effect. The second is damage to the vehicle’s radio, causing the crew to suffer from Fractured Chain of Command (unless it is a command vehicle). The third result destroys a weapon in the location hit, in the same manner as before. Lastly comes the Drive Damaged result. rather then simply immobilising the hull or turret, this result can be inflicted twice. When inflicted on the hull, the first result halves the vehicle’s Speed Points, and the second will Immobilise the vehicle. When suffered on the turret, the first result will inflict the Slow Traverse Turret rule, with the second jamming the turret in place. Obviously, if the turret already has that rule, it will be jammed after the first Drive Damaged result. Well done if you read through all that, hopefully these changes will make games go smoother, make things clearer for you, and add some more depth and realism to the game. Core Rules changes in the works. I am currently working my way through a whole load of changes to the core rules. Most are slight changes to the way certain rules work, while others are simply streamlining, clarifying or redefining rules as they currently exist. There are a number of additional rules, but these are all extras such as unit types and special rules. One real noticeable change is the vehicle damage chart, which i have altered to add more depth to the results. I will give details of the changes I have made, and an announcement that the new file is available, once I have tweaked a couple more things and uploaded the file. I have just uploaded a new copy of the Weapons Crib Sheet, with added Finnish and Hungarian weapons listed. There are still a few gaps, which we will endeavour to fill in. The wepaons crib sheet document can be found in the Core Rules section of the website. On another note, the website now has it’s own site icon (the little image in the corner of the window/tab in your browser). I have just uploaded the new version of the German Vehicle Cards, with the new armour values. One of the most common questions I am asked about Focused Firepower is why there are no ‘armour saves’ or similar game mechanic; some way of saving your troops from an attack. Simply put, if the soldiers under your command are shot, there is very little you can do about it. Medics are invaluable, but their skills can only go so far. This all comes back to the founding principal of Focused Firepower; the attempt to create a sense of realism, to make you realise the conditions soldiers face in war and how easily those precious and priceless lives can be lost forever. We also try to get the player to see it from a commander’s position, rarely conveyed elsewhere, having to make decisions that they know could well see their men never return. If a high explosive round from an enemy howitzer lands in the middle of a section of troops and explodes, they are almost certainly all going to die. There is no saving them from that, no matter how much a commander may wish it. That’s the rules for the Finnish available on the site now too. Italian Forces Document Now Available!